modlandUSA: Boomers, Brains, and You. Yesterday, I had an engaging conversation with someone I recently met (let's call him Shawn). The lively discussion eventually moved on to “sides of the brain”. I mentioned how enjoyable art classes were back in high school and explained my big idea at that time of higher education for furthering my creative learning and pursuing design as a career. Alas, that was not to be. My parents were not supportive. My oldest brother’s girlfriend even took some of my designs to a local artist who wrote a shining letter to my parents about the talent I had and encouraged them to let me develop it. So I wound up being analytical instead. Back to the conversation. We greed that we were both right brainers. 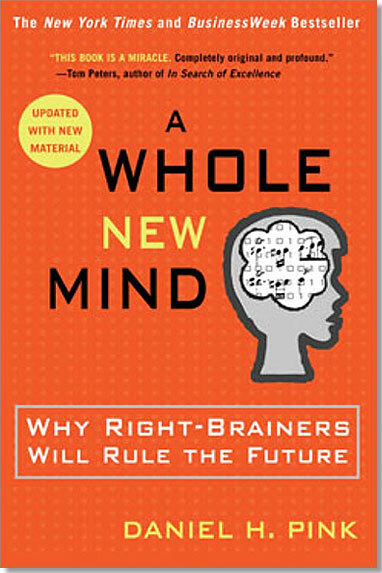 I pointed out that a book I read a couple years ago, “A Whole New Mind: Right Brainers Will Rule the Future” by Daniel H. Pink, was a huge awakening for me. I discovered that I was not alone in my "brain side confusion". According to the book many boomers were guided by their parents into left-brained professions. Doctors, lawyers, accountants, research analysts. And so it was with me as well. Now, I’m not saying that I never like numbers. I did enjoy my corporate life. Funny thing though, I truly enjoyed the graphic part of my work and would often spend too much time making Harvard Graphics or PowerPoint look “pretty”. And more than once I was criticized for it! I found other small ways to unleash creativity as well and sure enough, much of that was smashed down too. During one of the many seminars I took over the years (because the corporation liked you to get “out of the box” once in a while) I made a list of things I wanted to accomplish. Number one was “write a book” and I gave myself a time frame of five years to do it. Didn’t make it. But here’s the rub. Shawn said it was a good thing I learned how to use the left side of my brain. I gained the knowledge for running my two businesses. If I was gliding along right braining it all those years, would I have the savvy required to grow those businesses into major successes? He had a great point there! Now I’m seeing so many boomers starting their own businesses. Makes me wonder: Did they go through what I’m going through? I do know this. I’m in a very good position right now for growing my businesses. In fact, over the next few weeks, I’m working on revising one of my websites. Creative fun! Whee! I’ll continue to enjoy my photography hobby, writing blogs to share with you, tie-dying t-shirts, attractively rearranging the furniture in my house (mostly mid-century modern pieces), whipping out the acrylics once in a while to get those ideas and colors out, and of course, planning my book. I DO have an interesting concept for a work of fiction that I just started to document, so stay tuned! Right Brainers rule! I'm grateful for my time spent in the corporate world. It was a good foundation for my right-brained business. EVERY job we have plants us in a better position for the next -- even when we think they have nothing to offer. Hindsight might even suggest this is ESPECIALLY true when we think our job has nothing to offer ;-) It's great to be past the "climbing the corporate ladder" age! I did accounting and admin. work for a very creative visual communications company. Talk about being left brained in a right brained environment! I too was trained in a corporate environment and it serves me well as I pursue right brained activities. Good post. Hope you didn't spend too much time there Shannon. Agree. You learn something from ALL experiences, whether it's in a positive or negative light. I'm fortunate to have had a mostly positive past corporate life. That must have been interesting, especially if you are more right brained! I purged my left brain after Algebra II and have not missed it once. Never needed to use the quadratic equation or figure the hypotenuse of a right triangle. Was so relieved to find that there were other weird people who found creativity much more enjoyable that determining the mean, the mode, and the average. Right Brained and proud of it! So enjoyed the article!